Mission Manager has earned DT&E Safety Act designation from Department of Homeland Security. “The SAFETY Act designation illustrates our commitment to ensuring the highest level of operational effectiveness and data security to our customers ... while validating our respect for their highly sensitive, critical missions." Mission Manager, Inc. announced it has earned the U.S. Department of Homeland Security (DHS) Developmental Testing & Evaluation (DT&E) designation for its incident management software – a cloud-based tool that has helped first responders save lives and property in approximately 7,000 missions since its inception. The DT&E designation was instituted by the DHS to encourage the development of “promising anti-terrorism technologies” by providing legal liability protections under the Support Anti-terrorism by Fostering Effective Technologies (SAFETY) Act of 2002. To earn the DT&E designation, Mission Manager underwent a rigorous application process with DHS that included user interviews and evaluation of the software’s security levels, data integrity, infrastructure, in-place insurance, and systems of internal and quality control. Developed by a first responder as “freeware” in 2011, Mission Manager was re-launched in July 2014 as a subscription-based model with significant improvements in infrastructure, data security and technical support. These enhancements included moving Mission Manager to new servers at Amazon Web Services, which delivers a scalable cloud-computing platform with high availability and dependability in compliance with security best practices and IT standards. With the DT&E designation, Mission Manager is formally classified as a Qualified Anti-Terrorism Technology (QATT) by the Department of Homeland Security. This designation provides certain liability protections as set forth in the SAFETY Act for both Mission Manager and its customers in the event of a covered act of terrorism. “We will work diligently with the DHS, our key customers and partners as Mission Manager undergoes further testing and evaluation during the SAFETY Act certification process,” said Berthelot. Based on the core principals of Preparation, Readiness and Execution, Mission Manager provides a team-based operational environment for day-to-day tasks and serves as a real-time, shared situational awareness Command Center during incidents. The web-based software provides a turnkey solution for personnel and asset management, mission planning, real-time communications, tracking on robust maps and automated reporting. 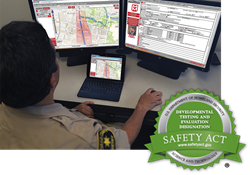 Above all, Mission Manager provides a common operational picture on multiple devices in disparate locations, ensuring a unified command and quicker response effort. It replaces the pen-and-paper and spreadsheet process of managing personnel and producing reports, saving agencies significant time and money.